Merle Wood & Associates is pleased to offer the ELEMENT yacht for sale. 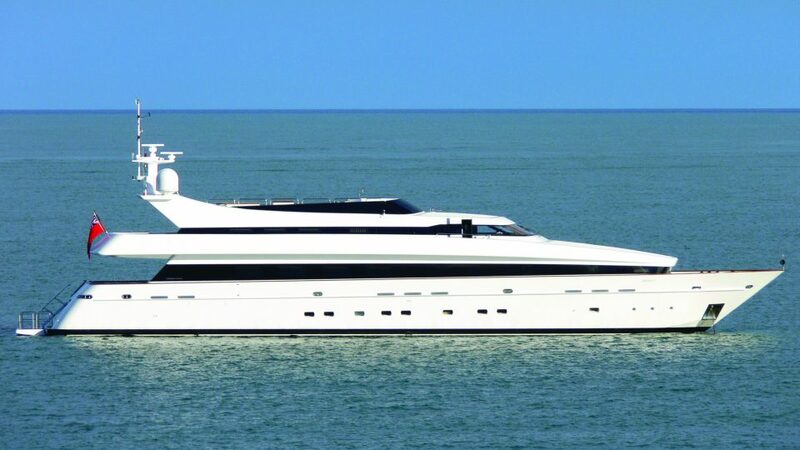 Modern and elegant, the Cantieri di Pisa motor yacht accommodates 12 guests in 6 well-appointed staterooms. Located forward on the main deck, the owner’s suite features large, horizontal windows offering sweeping views, a study, walk-in wardrobe, and his-and-hers en suite baths joined by a double shower. Additional guest staterooms consist of a full-beam forward VIP, 2 twins, and 2 double staterooms located on the lower deck. The VIP suite features its own small salon, horizontal windows, and a lavish en suite. All other staterooms are equipped with their own entertainment system and well-appointed en suites. We are honored to have the ELEMENT yacht for sale, and we are pleased to welcome her to our fleet of exceptional vessels. Having sold more Italian-built mega yachts than any other brokerage firm, we are confident that ELEMENT will be added to our sales record in short order. We are offering the ELEMENT yacht for sale with an interior that features contemporary styling by the shipyard, and Frédéric Mechiche, who created a main salon with neutrally hued sofas and chairs, as well as carpeting that contrasts with some of the darker furniture. Throughout the yacht, red, white and blue accents appear in the throw pillows both inside and out. The ELEMENT yacht for sale boasts outdoor dining on the main deck aft, which features an oval dining table and loose wooden chairs with red cushions. Additional seating here is offered on the built-in settee aft that is peppered with red, white and blue accents. She also features a more casual social area up on the bridge deck aft, as well as a vast sun deck with a large Jacuzzi and abundant sunpads. Powered by twin MTU 16V4000 M90 diesel engines @ 3,700hp each, she is able to reach a maximum speed of 26 knots and a cruising speed of 20 knots, with a nautical mile range of 800 at an economical 12 knots. As a luxury yacht broker with nearly 20 years at Merle Wood & Associates, John Cohen has traveled the globe to inspect, build, purchase, and sell luxury yachts of all sizes and types. As a former yacht captain, he is regarded as one of the most astute professionals in his field, and is highly respected by clients and peers alike. For additional information, read the full ELEMENT yacht specs or view the ELEMENT yacht price and details. For information about the ELEMENT yacht for sale, or for expert knowledge from a qualified yacht broker, simply contact the luxury yacht brokerage firm of Merle Wood & Associates for assistance.